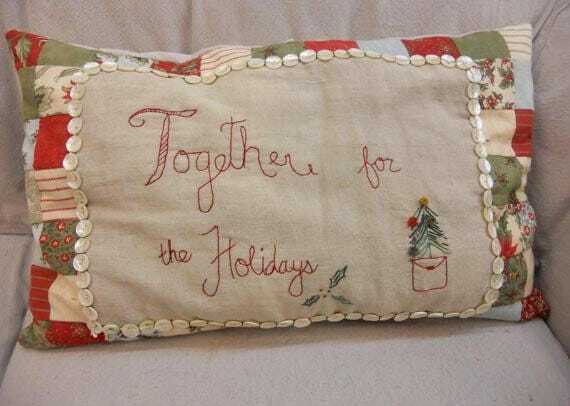 Holidays Together (a pillow) kit...designed by Mickey Zimmer. This pillow is a perfect companion to any Christmas or Holiday festivity. Its message is simple, classic, and elegant. This project combines some of our favorite things...linen, painters' cloth, mini charm packs, button trim, embroidery, and wool. Classic embroidered linen is set off by shell button trim and a mixture of elegant 3 Sisters Winterlude prints. Pillow measure 16 x 23 inches. Kit includes: Linen for front, threads, wool, button trim, painters cloth for back and pattern.